Last week we broke the news that Teenage Mutant Ninja Turtles co-creator Kevin Eastman would be partnering with new co-writer Tom Waltz and series artist Dan Duncan for an all new TMNT comic at IDW. In addition to co-writing, Eastman will also be contributing variant covers for select issues and working alongside Duncan by contributing page layouts. We connected with the creator to get an insight into his return to the characters he created with Peter Laird in 1984, plus what it's like to be part of a new team telling all-new TMNT stories in a new continuity. Hit the jump for the full interview. ComicsAlliance: Congratulations on the new TMNT comic! How does it feel to be back at work on a new Turtles comic after a few years away? 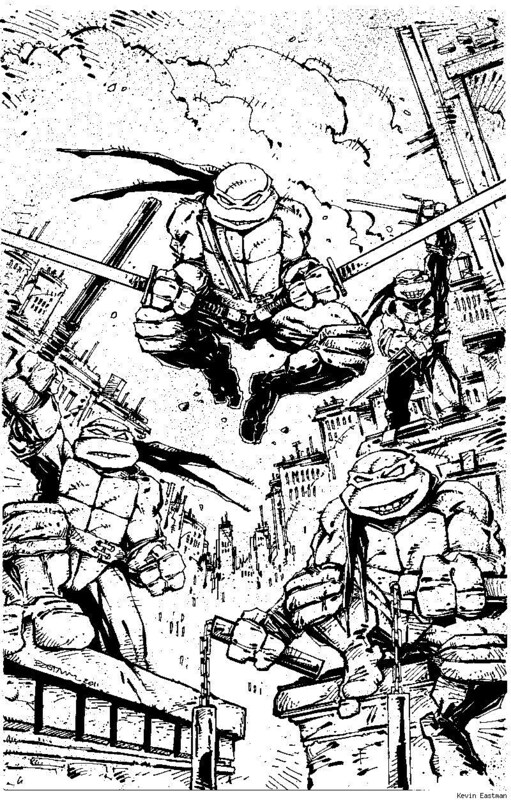 Kevin Eastman: Awesome, really awesome actually! I really haven't drawn on a TMNT comic project since I did "Bodycount" for Image with Simon Bisley, and that wrapped up around 1996--that pretty much was the last Turtles story I did--other than doing free convention sketches for the greatest fans a guy could hope for. When IDW nailed the deal and called to see if I would be interested in working with their team on the new series, I was not only honored--I got REALLY excited! It had been fifteen years since I got to to that "turtles" creative part of my brain place, and think I said YES before they finished asking! 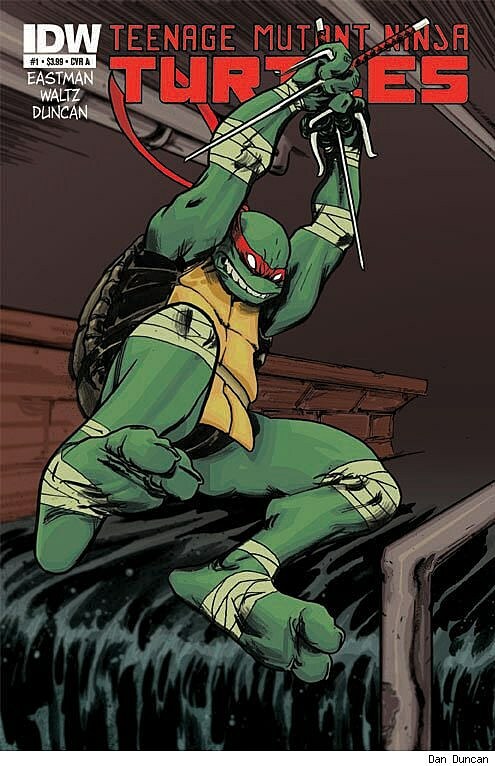 CA: Not only are you co-writing the new TMNT series, you're also contributing layouts and illustrating variant covers. How do you think your art style and approach to these characters has evolved over time since the first appearance of the Turtles? KE: To say I'm co-writing feels like I'm stealing more of Tom's genius than I deserve, and I am having far to much fun to make this feel like any kind of real work! I have been overwhelmed with his wealth of ideas, his knowledge and research of all the TMNT universes and fierce commitment to all the core of the idea and making them the coolest ones yet--a page we are both firmly on! For layouts (not that Dan needs any) and covers, as well as generally getting back into the groove--it took me between one and two seconds to find myself back in that "I get to draw turtles for a living" head space from the late 80's when I started sketching the first cover or roughing out the first page. It's that "riding a bicycle" thing--I feel like I never got off. CA: What's it been like working with new series artist Dan Duncan? What about his style makes him a good fit for the TMNT? KE: Much like working with another writer like I did with Peter Laird and several others over the early TMNT years, working with other artists; Simon Bisley, Richard Corben, Mark Bode, and many of the awesome original Mirage Studios crew--THAT was the fun stuff! I ALWAYS loved the energy these guys brought to the table, and Dan is right there--bringing his A game and having fun with it--and all of that shines through in a big way. TMNT fans, old and new, will love his work! CA: Being involved in both the writing and illustration aspects of the series makes the new TMNT series a pretty collaborative endeavor. What attracts you to working this way and having such a high level of involvement in each issue's creation? KE: For me that is the key--that is the place I love to work the most--with other creators--it really gets the ideas flowing--and the back and forth/give and take always seems to land the best ideas. Look, we all stand on the shoulders of giants that we followed, writers and artists that got us so excited about what they were creating and we were devouring--that we HAD to be part of this world--so we could create our own worlds. What could be better than sitting around brainstorm with other "like minded talents" and coming up with these stories and adventures?! I really am having a blast! CA: One of the biggest changes in the new series will be the introduction of new villain Old Hob. What's most distinctive about Old Hob and what separates him from previously seen antagonists the TMNT have faced? KE: First, I'm not going to tell you, and second I don't want to spoil it for anyone! Okay, I'll tell you a little... I love this guy. For the overall creative, I feel the concept of this character not only embraces all the heart and soul of so much of the original materials--it ties in so neatly it almost seems like it was never not there. I think I'm going to have to start practicing my convention sketches of Old Hob right now, and I think he'll be moving up the request list pretty quick. CA: You've got Sam Keith and Walter Simonson contributing covers to the first two issues. From an artist's perspective, what's it like having other icons put their spin on the TMNT? KE: Not only is it mind blowing, it is mind blowing on two different levels! Level one, Walter Simonson is a living legend--one of the true greats and one of my personal heroes! I'm floored! Level two, Sam Keith is a freaking genius, and I have been a fan of his work (and creations) going back to the days when we were doing the convention circuit doing Batman sketches more than our own characters to buy comic at the end of the show! I can't wait, this is AWESOME!